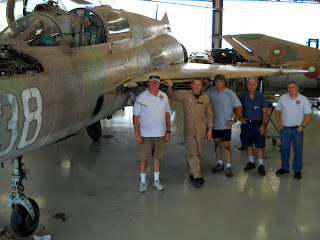 We are moving towards having the Cold War Air Museum, Mig21 on static display during the Sept. 5th airport open house. 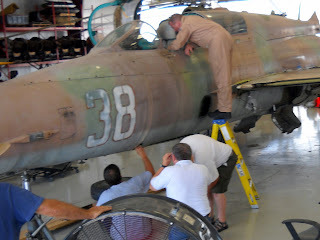 After attaching the wings, and raising the aircraft, we could work on getting it on the gear. 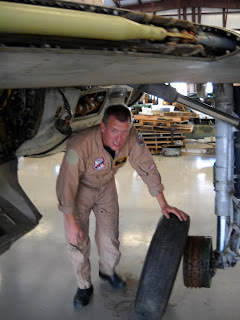 Jon almost fits under the wing as he checks the tires against the gear. The wheel bearings were removed, cleaned and lubricated before the wheels and tires were mounted. The tires shipped with Bord 38 show a great deal of wear and will be replaced before the aircraft reaches flight status. Main gear down, the team is ready to extend the nose gear. Jon studies the cockpit to locate the emergency gear extension pull handle. It is important to identify which Red Handle to pull! The aircraft stands very high off the ground. 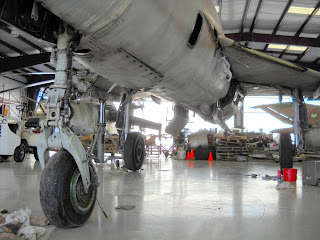 This gives clearance both for the large tires used for the main gear and raises the intakes higher above the taxiways and runways to help avoid intake of snow, water and FOD on the bases where these aircraft were originally located. With the completion of another busy day, the work crew paused for smiles and a picture. 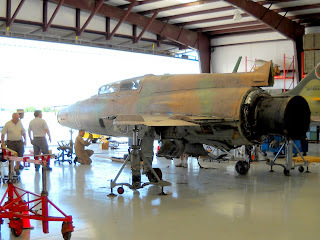 The wings will come off at least once more for additional work and a myriad of hydraulic connections remain to be checked and connected before final assembly.